Bad Hats Theatre Co-Artistic Director Fiona Sauder adapted (with Reanne Spitzer) and played the title role in Peter Pan, a new musical interpretation of the classic story that toured to breweries around the city in December and scored an Outstanding Ensemble nomination for its versatile, energetic, and imaginative cast. 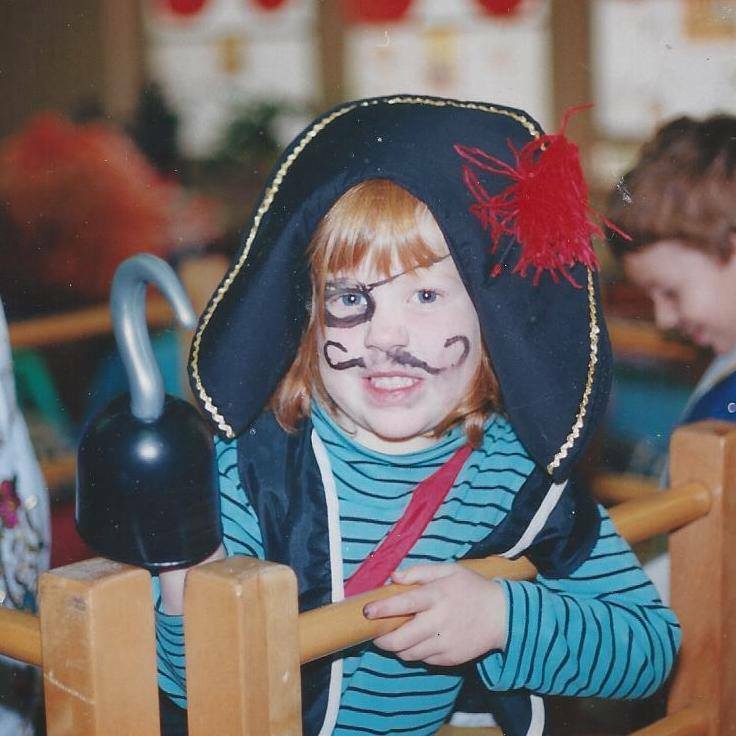 We caught up with Fiona (pictured below cleverly disguised as the enemy) to find out all the secrets of creating Neverland with just a sheet and some cardboard swords. The first show I did was Seussical The Musical in gr. 1. I played the Cat in the Hat. Recently, a friend who was also in that production reminded me that I got the role after I stormed in and told the directors I refused to play any other part. So. That sort of got the ball rolling. Tell us about the formation of Bad Hats Theatre and its mandate. Bad Hats began after I graduated from George Brown Theatre School and Nicola Atkinson (Co-Artistic Director) and I began adapting my third year solo project into a one woman show called The Gold One. It was developed, like everything to follow it, collectively and led to the notion that every contributor in our company should have an equal voice in the room. Over the years our team has grown and now boasts incomparable collaborators like Matt Pilipiak (Managing Director), Lauren Vandevoort (Marketing and Publicity), Victor Pokinko (Artistic Associate), Ariana Sauder (Graphic Design) and many other frequent flyers. While our style is very distinct, the genre of work we do spans a wide range. Our focus is always on multidisciplinary, new works that emphasize the most extraordinary ways to tell any given story. How did the idea come about to adapt Peter Pan? What was it about that story that really resonated with you in 2016? Well, this actually all began in the basement of the Grand Theatre in Sudbury in 2015. Landon Doak, who composed the music for the show and plays Michael Darling, was in YES Theatre’s Production of American Idiot, which I was directing. We’d known one another for a few years but really connected during that project. Landon had mentioned he wanted to produce a show at a Brewery owned by his family in Port Perry – The Old Flame Brewery. He’d done this the previous summer with a musical take on Romeo and Juliet and was looking for a family holiday hit. One day, when we were in the bowels of the old theatre looking for ghosts, I got on some tangent about how much I loved the story of Peter Pan and it clicked. Landon told me to start writing an adaptation. What were some of the key ways you updated and altered the story through the adaptation process? Well, it was written in 1911 so there’s a lot of archaic, offensive garbage in the story. It’s also not as simple as Disney made it out to be. There are many chapters and details from the original story that few people know. So, in the interest of streamlining the narrative and avoiding a parade of racism, we (myself and Reanne Spitzer) eliminated the ‘red skin’ plot and centred the conflict around the Lost Boys vs. Pirates, Peter vs. Captain Hook. For me, one of the book’s strongest themes has always been sense of play and our ability to recall it. We reframed our structure to feature the benevolent pirate Mr. Smee, in a later chapter of his life, who is recalled to Neverland by the spirits of the story and reminded how to believe, to play, to fly. This notion became the backbone of our staging and storytelling style, which hinges the possibility of magic on their willingness to believe and play along with us. Did you always intend to play Peter yourself? What attracted you to the role? 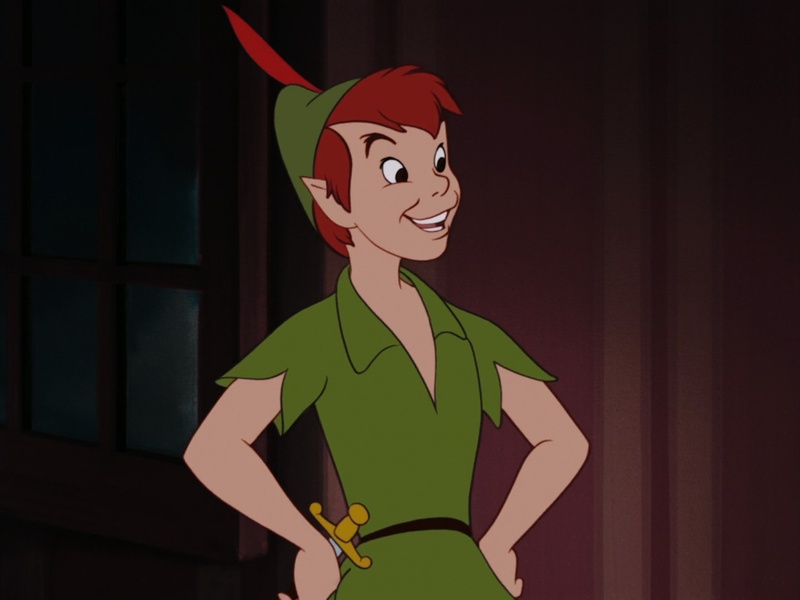 Well, for a while now I’ve specifically styled my hair like the cartoon Peter Pan. So I get that a lot. But, no, I never imagined I would play the role. Originally, Landon thought I should direct the piece but he called me sometime in the summer of 2015 and said “Hey. I just realized we can’t do it unless you play Peter. You’re just…You’re Peter.” Which was maybe the nicest thing anyone has ever said to me. Your adaptation confronted some of the awkward gender politics in the original story and elevated the female perspectives. How did that update change the dynamic of the traditional casting of Peter as a woman? Well, naturally, the silly misogyny needed immediate extraction. Obviously Wendy is entirely capable of saving herself on the pirate ship and making her own decisions and doing all the regular things smart human women can do. As for Peter, other than being captivated by that confidence, these changes don’t affect him much, nor did they affect our casting. Peter is more of a genderless sprite, attracted to the shiniest thing in the room. So, if Wendy is written to be the brightest light in the story, the attraction will always make sense, no matter the casting. 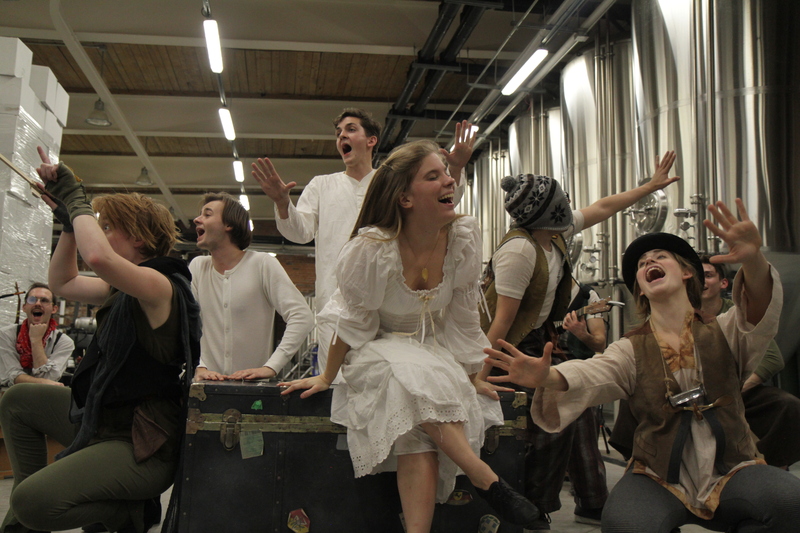 You toured the production to breweries around the city, necessitating imaginative and adaptable bare-bones staging. What were some of the most fun ways you found of telling a sprawling story with such practical limitations? You were also a producer on the project. What were some of the biggest hurdles the show faced along the way? We didn’t have enough chairs. Tell us a bit about working with director Severn Thompson and how her vision fit with yours as adaptor. Nicola and I met Severn when she directed us in The Munsch Bunch at George Brown. Severn was insistent that the show, adapted from five Robert Munsch stories, be created by the entire ensemble. We spent the first four hours of rehearsal having a group discussion about imaginary friends. I remember catching Nicola’s eye that day and many times throughout the process, sharing knowing glances about how jazzed we were that she was speaking the same language as us. When Bad Hats took on producing and expanding Peter Pan, deciding who would direct was a very short discussion. Severn managed to enter a room full of artists with established creative bonds and not only make herself part of that family but an invaluable asset to the story. She took the ship we made and steered it in the right direction. It could not have been smoother sailing. How did the Outstanding Ensemble-nominated cast come together and what were some of the ways the casting informed the piece? The majority of the cast were returning members from the Old Flame production. However, there was some replacing and shifting. 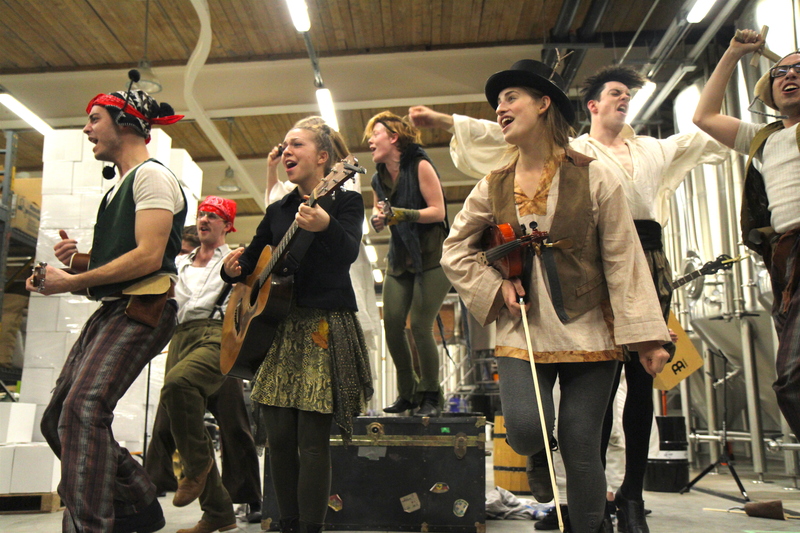 Reanne Spitzer, who originally directed and choreographed the piece in Port Perry, stepped in as Tinkerbell / Starkey the pirate for the brewery tour. We also acquired a new John Darling in Victor Pokinko and a new set of twins in Tal Schulman and Dan Volchok. Like Reanne, Dan was involved in the Port Perry performances but he was strictly a musician at that time. We chose to take a risk and give him his theatrical debut as Curly / Bill Jukes. It paid off in every way. The piece is meant to be shaped by the people imagining along with it. Do you have any fun stories from the kid-interaction elements of the play? For me, the show is so much about reinvigorating and revitalizing. It works on the assumption that the audience is very emotionally intelligent and, young or old, they all know exactly where Neverland is. Our job is not to let them in on a secret, but to remind them of something they already know inside and out. I think if the audience leaves with a desire to play then we’ve done our job. Ugh. Stupid, hard question. I really like the sword fight with Captain Hook. Our fight director, Jack Rennie, did an excellent job with it. I also really like flying. I mean, who wouldn’t? I like the sound Wendy (Lena Maripu) makes when she wakes up from her nap. I like everything Jocelyn Adema does as Tootles. I like Matthew Finlan dancing at anytime. I like when we take a child backstage and kill them and everyone just accepts that that’s okay. I like glitter-bombing everyone. Oh! And Victor Pokinko playing a six-foot nine-year-old in a night shirt never fails to disappoint. Hah. The list of things we’re developing is just about two projects shy of a billion. You’ll have to look on our website to find out about each of them and stay tuned. I can say, however, without giving too many of the details away, that Peter Pan will be returning this December. So get stoked.